Please RSVP to Michele Bahl at mibahl02 at yahoo.com by Friday, March 31. Intimate Portraits of Gaza’s Lost is based on the #ObliteratedFamilies project by French photographer Anne Paq and Palestinian-Polish journalist Ala Qandil. 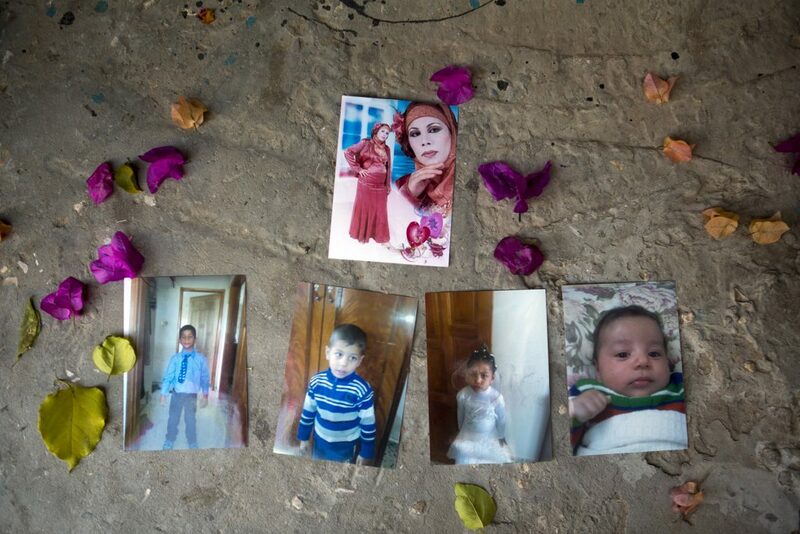 The project profiles Gaza families partially or entirely annihilated during the Israeli bombardment in 2014. Statistics and figures, political facts and flash point dates too often obscure the staggering consequence of each extinguished life. #ObliteratedFamilies never departs from the perspective of the witness – the survivors left in grief, the neighbors who last saw the families alive, the friend who tried to find them safe shelter, and sometimes the photographer herself. To view the photos, narratives and projects, visit #ObliteratedFamilies. Free and open to the public; beverages and desserts including baklawa will be served. Donations will be accepted for the Samira Project for traumatized children in Rafah (or you can donate here). The event will also offer the latest batch of gorgeous many-colored kufiyahs direct from Hirbawi Textiles, the new shipment of Holy Land Olive Oil and our other Palestinian crafts for sale. And don’t miss the return of Door Prizes! We hope to see you on April 2 as we once again reaffirm our commitment to Gaza. Ala Qandil is a Polish-Palestinian journalist, a former correspondent of the Polish Press Agency, who had been covering for more than three years political, social, historical and cultural stories from Palestine/Israel and other countries in the region, with special focus on human rights issues, women rights, minorities, non-violent resistance, and including the previous two Israeli military offensives in the Gaza Strip. Qandil has worked with various international and Polish media, including Al Jazeera English and the Middle East Eye, number of weekly magazines and she often appeared as a guest commentator on Polish radio and TV. She produced and co-directed a short documentary about food resistance in Palestine “Resistance Recipes”. Qandil is a co-founder of Reporters’ Collective, an initiative of Polish writers based in Middle East, Africa and Asia, whose goal is to bring quality, in-depth foreign reporting on global issues to Polish audience. During the last two years, in between the work on the “Obliterated Families”, she had reported from the Balkan route and Greece on the stories of refugees arriving in Europe. The event is co-sponsored by Madison-Rafah Sister City Project, the American Friends Service Committee group of Madison Friends Meeting, Playgrounds for Palestine-Madison Chapter, Mary House of Hospitality, Colombia Support Network; Memorial United Church of Christ-Fitchburg, Women’s International League for Peace and Freedom-Madison, Jewish Voice for Peace-Madison, and Good Shepherd Parish social justice committee. March 16, 2017 marks 14 years since an Israeli soldier killed 23-year-old American peace activist Rachel Corrie with a bulldozer as she protested the demolition of a family home in Rafah, Gaza Strip, Palestine. April 10 is Rachel’s birthday. Each year between these two dates, the Madison-Rafah Sister City Project (MRSCP) honors Rachel’s memory with an event that benefits Palestinian children. This entry was posted in MRSCP and tagged Event, Gaza, Rachel Corrie, Rafah, Violence by admin. Bookmark the permalink.